Below we have listed the best hummingbird feeders for 2019. Hummingbirds will learn to use most any feeder, so whether or not a feeder will attract hummingbirds is not part of our criteria. We have tips on how to attract hummingbirds to your feeders. Easy to fill - don't use red dye nectar! Extra features like perches, built-in ant moat (how to keep ants out of your feeder), feeding ports that divert rain, hanging and mounting options, etc. 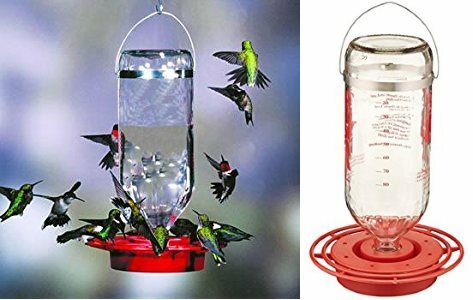 We have tried lots of different types of feeders and we have come to the conclusion that the best hummingbird feeder overall is the Aspects HummZinger Feeder. The Hummzinger is a type of saucer feeder, which is drip-free unlike vacuum bottle style feeders. Read more about choosing a hummingbird feeder and the different styles. The HummZinger comes in a variety of models: Classic, High View, HummBlossoms, and HummZinger Fancy. The difference between the HummZinger Classic and High View is the perch position. In the High View, the perch is elevated above the feeding ports. This isn't necessarily a benefit for the hummingbirds, but more so for the birdwatcher as it offers unobstructed views of the entire bird. I've watched hummingbirds using perches on both the Classic and Highview and it doesn't seem to make much difference; some hover and sip, and some perch and sit on both models. So if you prefer a better view of the hummingbirds, get the Highview. Both the Classic and High View come in three sizes: 8 oz, 12 oz, and 16 oz. Leak and drip proof - the basin style feeder (vs the tube style gravity fed feeder) where the nectar cannot drip and leak, is the best advantage of this feeder. Leaky feeders attract bees, wasps, and ants more so than basin feeders. Ant-moat - I love the built in ant moat. You simply fill it up with water and ants or other insects are blocked from reaching the feeding ports. They designed it with overflow holes so you can't overfill it or rain water won't overflow into the main feeding basin and dilute the nectar. The polycarbonate construction is very durable and long-lasting. We've had our for years and it shows no signs of cracks or weak points. Dishwasher safe - for easy cleaning, you can throw it in the top rack of your dishwasher. But, we usually just wash it by hand with a mild vinegar solution. Lifetime guarantee - Aspects HummZinger hummingbird feeders come with a lifetime guarantee against defects or damage. You can hang or post-mount your feeder. There is a 5/8" hole on the underside of the feeder where you can insert a wooden dowel or copper tubing for mounting. The HummBlossoms are small capacity feeders (4 oz) with the idea that you can place more of them all around your yard without hummingbirds becoming so territorial over one particular feeder. The HummZinger Fancy is a little more decorative, but still as functional as the classic, so that's up to you if you want a little more flare in your feeder design. The Fancy comes in 8 oz and 12 oz sizes. Aspects also makes two types of window feeders: the Jewel Box and Gem. 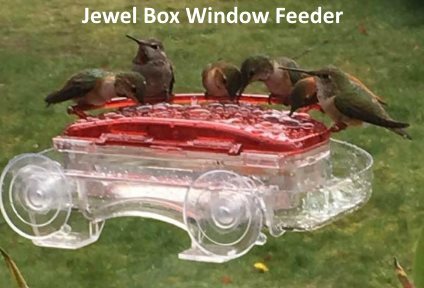 The Jewel Box feeder has an 8 oz. feeding capacity with 3 feeding ports. The Gem has a 4 oz capacity. I like how easy it is to fill. You can slip out the nectar container without having to remove the feeder from the window. And then the top of the container hinges up for easy filling. We like glass reservoirs over plastic because they don't deteriorate in the sun like plastic, so they're longer lasting. Also, they don't retain and promote mold growth and are easier to get completely clean. This 32 ounce Best Hummingbird Feeder by Bird Choice (also comes in a 8 oz size) is a great large capacity feeder with a glass bottle reservoir and 8 nectar feeding ports. The base comes apart fro easy cleaning. It's a simple design, but simple is good. Easy to fill. Easy to clean. We have a page dedicated to glass hummingbird feeders which include hand-blown glass feeders, vintage antique glass hummingbird feeders, as well as other clear glass tube style feeders. What size hummingbird feeder should I get? Unless you have a lot of hummingbirds, don't get the biggest capacity unless you can commit to changing out the nectar and cleaning the feeder when it's necessary: at least every 3 days in hot weather and 6-7 days in cool weather. I know some people will fill up a feeder with 16 ounces and then let it sit in the warm weather for a week or more because they don't want to throw away the nectar or because they're lazy. 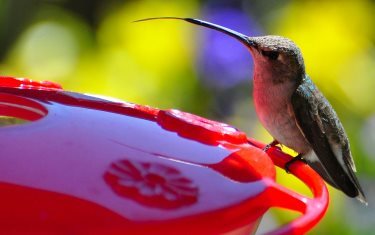 If you do want the larger capacity size feeder, and find that the hummingbirds aren't drinking it up as quickly, then you could always fill it up partially if you don't want to waste nectar. Yes, we are putting out feeders for our own enjoyment, but also to feed hummingbirds. If we put out nectar that is growing mold and fermenting because we're too lazy to change out the nectar and clean the feeder, then we're better off not feeding them at all.